Before I delve into the accounting loopholes used to prop 3rd-quarter earnings, I will start with pointing out the intimidating amount of choice for ETFs in the financial sector. 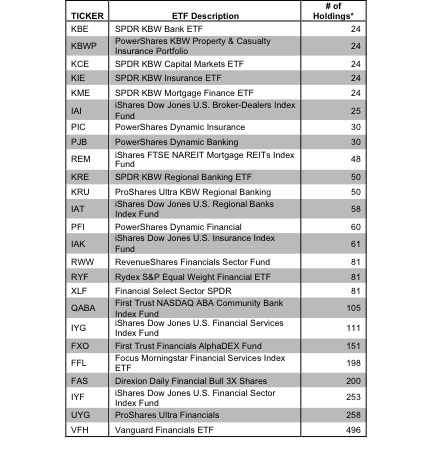 There are 25 finan­cial sec­tor ETFs. These 25 ETFs have dras­ti­cally dif­fer­ent stock hold­ings and, there­fore, allo­ca­tions. The low­est num­ber of hold­ings is 24 while the high­est is 496, per figure 1. How is an investor interested in financial sector ETFs supposed to choose among all the many options? 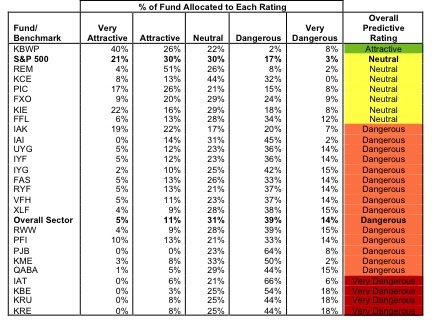 For starters, investors interested in the financial sector cannot expect many good investment options given that the sector gets my “dangerous” rating and ranks ninth out of the ten sectors that make up the economy. Details are in our sector roadmap report. As detailed in my prior article on how to find the best tech ETFs, ETF issuers have admitted that the landscape for ETFs is a bit cluttered and needs attrition. They did not, however, offer any solutions. Like most Wall Street types, the issuers are focused on how to profit from ETFs not how to help investors profit from ETFs. Thank goodness for independent research. To identify the best ETFs within a given category, investors need a predictive rating for ETFs based on analysis of the underlying quality of earnings and valuation of the stocks in each ETF. See Figure 2. My free stock screener provides my ratings on 3000+ stocks – updated daily. Assessing quality of earnings is especially important in the financial sector, where earnings manipulation is at its worst. For example, during the financial crisis FASB, despite many objections, introduced SFAS No. 159, a new accounting rule that enables banks to artificially boost earnings. Bank of America (BAC – dangerous rating) enjoyed $4.5 billion of SFAS No. 159 mush to push their 3rd-quarter pre-tax profit to $4.2 billion. Citigroup (C – very dangerous rating) used the accounting loophole to boost earnings by $1.9 billion, 50% of its $3.8 billion 3rd-quarter net income. This loophole is just one in a long line of tricks that have enabled some of the major banks to mislead investors. Click here for my article on Citigroup’s earnings manipulations and here for my article on Morgan Stanley’s accounting shenanigans. The takeaway is that investors need to be careful to avoid these stocks and the ETFs that hold them. Moreover, too many investors have been misled to believe they can trust the ETF label, i.e. 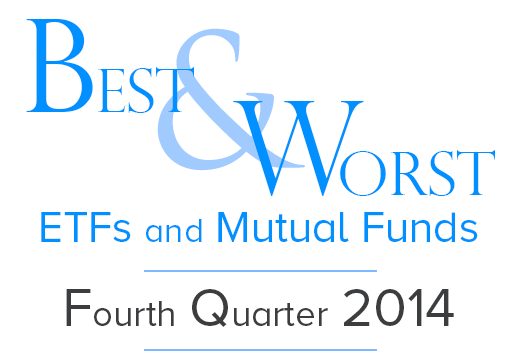 category, and believe that all ETFs within a certain category are the same when they are not. Figure 2 shows clearly that there is wide range of quality within financial sector ETFs. For example, both PowerShares KBW Property & Casualty Insurance Portfolio (KBWP – attractive rating), our top pick among financial sector ETFs, and SPDR KBW Bank ETF (KBE – very dangerous rating), one of our worst picks, hold 24 stocks. Obviously, given the disparity in their ratings, these two ETFs chose very different stocks to hold. And the only way to know the differences in the quality of holdings between these ETFs is to do the diligence and analyze each holding. As highlighted by Barrons’ The Danger Within, for research on funds to rival the quality of research on stocks, fund research must be based on rigorous analysis of all the holdings within a fund. Dis­clo­sure: I receive no com­pen­sa­tion to write about any spe­cific stock, sec­tor or theme. 4 replies to "ETF Shoppers: Accounting Trickery At Its Worst In Financial Sector"